The first House Public Education Committee of the session gave us a good indication of some of the policy issues members will be looking at in the coming months—including a a review of two controversial laws governing the requirements for turning around (or closing) schools with Improvement Required (IR) accountability ratings. Today representatives from the Texas Education Agency, including Commissioner of Education Mike Morath, gave presentations outlining the current state of policy for public education. 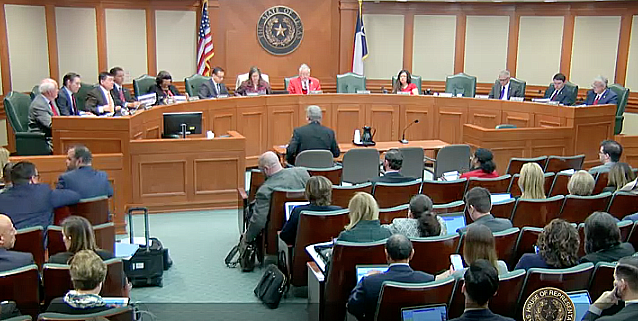 Huberty on several occasions stressed that he wanted to discuss different options for HB 1842, the bill that mandates TEA to either close a campus or appoint a state board of managers for an entire district, if a campus receives five consecutive years of IR ratings. Tied to that bill is another slated for review—SB 1882, which encourages districts to form “turnaround partnerships” with nonprofits and/or charters school operators to create in-district charter schools at IR campuses. If TEA approves SB 1882 applications, the district receives $1,800 more per-pupil in funding for students on the campus, and a reprieve for two years from the harsh sanctions of closure or school board takeover in HB 1842. The duo of bills created a perverse incentive for districts to pursue charters school operators to take over operations of their struggling schools. The situation in Houston ISD has put the spotlight on the absurdity of the HB 1842 sanctions, since an IR rating in year five for just one campus out of the district’s 283 schools could result in the TEA appointing a board of managers to take over the democratically-elected school board for one of the largest districts in the nation—a situation that the district narrowly avoided last year. Huberty asked a TEA official today if Houston had applied for any turnaround partnership under SB 1882 and was told it has not, but that it has until February 4 to file an application. Texas AFT will be actively working to make changes to both bills. We have long opposed—though local advocacy and a lawsuit against TEA—school district efforts to form partnerships with charter schools that remove public oversight or that disregard parent, teacher and community input. As we call for a moratorium on charter school expansion in the state, we are also working to oppose laws and policies that remove public schools from control of locally-elected school boards.